Okay, so maybe that list is just a little extreme, but it all boils down to 5 basic types of fears from which all other fears are manufactured. Extinction—the fear of annihilation, of ceasing to exist. This is a more fundamental way to express it than just calling it “fear of death.” The idea of no longer being arouses a primary existential anxiety in all normal humans. Consider that panicky feeling you get when you look over the edge of a high building. Mutilation—the fear of losing any part of our precious bodily structure; the thought of having our body’s boundaries invaded, or of losing the integrity of any organ, body part, or natural function. Anxiety about animals, such as bugs, spiders, snakes, and other creepy things arises from fear of mutilation. Loss of Autonomy—the fear of being immobilized, paralyzed, restricted, enveloped, overwhelmed, entrapped, imprisoned, smothered, or otherwise controlled by circumstances beyond our control. In physical form, it’s commonly known as claustrophobia, but it also extends to our social interactions and relationships. Separation—the fear of abandonment, rejection, and loss of connectedness; of becoming a non-person—not wanted, respected, or valued by anyone else. The “silent treatment,” when imposed by a group, can have a devastating psychological effect on its target. Ego-death—the fear of humiliation, shame, or any other mechanism of profound self-disapproval that threatens the loss of integrity of the Self; the fear of the shattering or disintegration of one’s constructed sense of lovability, capability, and worthiness. So, you probably have a fear of something. Can you identify it? Can you break it down to the root or which one of those 5 types of fears it falls into? If you can, you are already taking a step in the right direction. 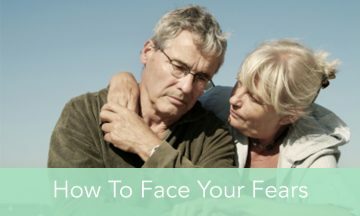 But now that you have identified your fear, what are some ways to help you conquer it? Since we cannot control everything in our lives, it is only reasonable that you cannot fully eradicate fear from your life forever, however, you can make choices that will help you move beyond the things you are afraid of. Cognitive behavioral therapy is a great method for processing fear and choosing to rise above it. Cognitive behavioral therapy (also known by its abbreviation, CBT) is a short-term, goal-oriented psychotherapy treatment that takes a hands-on, practical approach to problem-solving. Its goal is to change patterns of thinking or behavior that are behind people’s difficulties, and so change the way they feel. It represents a systemic approach to managing your emotions through changing thinking and behavioral patterns. CBT is not a miracle cure. It involves a lot of work for identifying your current thinking patterns and beliefs, seeing what is irrational or non-constructive in them, and changing them gradually through cognitive and behavioral techniques. It’s based on 3 R’s: reprogramming, repetition and reinforcement. If you stick to these three ways, you will see real progress and change in your habitual emotional reactions. So, if you came here for actual results and not all the science-y talk, what are some small steps you can take to overcome your fears? Journal your fear– Write about your fear and how it has held you back. Go back after some time and reflect on what you’ve written. You will gain insight just by distancing yourself. It will also help you to loosen the grip that fear has on you. Lean into your fear– Start small and work your way into overcoming your fear. Tell yourself “this fear will pass” and expand your courage and willingness to grow. If you are afraid of talking in front of a large group of people, start with 5-10 people and grow it from there. Journal your successes, both past and present– Its human nature to beat ourselves down. If you take the time to reflect on the good things you have done, that fear will seem smaller. Think back to your early years when you learned something new for the first time, like riding a bike, and continue to the present. You will be inspired and motivated at how that list can help you overcome fear. Believe in yourself– Focus your attention on being prepared and willing for the joy, wonder, and great possibility of the circumstances that come before you. You deserve the best no matter what. Accept that fact and be open to what lies ahead. Take your fear and let it go– Let go of looking silly, feeling embarrassed, being ignored and facing rejection or failure. Accept failure as a part of life. Get through it and get over it. Help others– Give to the beginners. Be a good leader. Take others with you and help them succeed as well. What would life be like if we believed in, “All for one, and one for all?” We all want the same things in life. Let’s help each other move ahead. View life as a creative and wild adventure– Life can be brimming with good times of beauty and adventure or overwhelming with challenge and tragedy. Choose to stay present and breathe through it all. Be grateful for the varied landscape, hold onto your hat, and enjoy the ride. What are your experiences with fear? Share with us in a comment below on your success of facing your fears.